Be Our Guest | News and Features | Style Weekly - Richmond, VA local news, arts, and events. The John Marshall has hosted governors, celebrities and presidents. Here are a few of the famous faces. 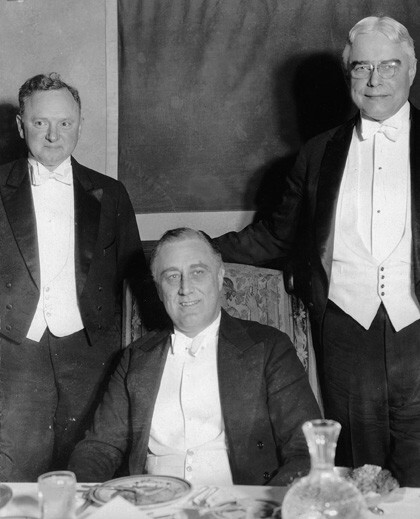 The 1929 opening dinner at the John Marshall, with tables decorated with lavish floral arrangements and large American flags hanging from the balconies, was attended by Mayor J. Fulmer Bright with Rabbi Edward N. Calisch of Congregation Beth Ahabah (called the "Dean of Virginia's Public Speakers") joining the pastor of Second Baptist Church on the dais. The following evening the League of Women Voters presented a lavish ball with Gov. Harry Byrd and five former Virginia governors attending. Costumed in 18th-century attire, Richmond debutantes and their escorts presented a choreographed figure while Richmond artist Elinor Fry offered something more attuned to the 1920s — an "airplane dance." With Richmond now boasting a modern hotel worthy of large and prestigious gatherings, the National Governor's Conference convened here in April 1932. It being a presidential election year, the question of whether Gov. Franklin D. Roosevelt of New York or Maryland's Gov. Albert Cabell Ritchie would get the Democratic nod lent intrigue. Many Virginians were pulling for Ritchie because he was Richmond-born (appropriately enough, on Governor's Street). He also would have been the ninth Virginia-born president if elected — which he wasn't. The conference also was the occasion for the first presidential visit to the John Marshall. Republican Herbert Hoover sought a second term despite Depression-era unemployment approaching 24 percent. He economized on his trip by boarding a regularly scheduled train. The conveyance, it turned out, also carried 27 convicts en route to a work camp and a black bear in the mail car. In future decades the hotel played host to other presidents — Eisenhower, Nixon, Ford, Carter and Reagan, numerous first ladies and a carousel of notables including Elvis Presley and Elizabeth Taylor. 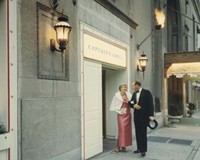 On Oct. 14, 1934, Capt. Eddie Rickenbacker, the nation's most celebrated ace pilot — he'd destroyed 22 German planes and four balloons during World War I — was honored with a luncheon. A more mischievous aviator was celebrated on Jan. 18, 1939. Douglas Corrigan arrived at Main Street Station and later that day promoted his book, "That's My Story," at the Miller & Rhoads department store downtown. Then at the John Marshall he and local aviators were luncheon guests of Richmonder Ivor Massey Sr., himself a flyer. Corrigan had captivated the public — and irked authorities — in 1938 after his solo flight from Long Beach to New York where he refueled and filed a flight plan for his California return. Inexplicably, 28 hours later Corrigan landed in Ireland. The press ate it up and anointed him "The Wrong-way Flyer." A starring role in the 1939 movie version of his exploits, "The Flying Irishman," made "Wrong-Way Corrigan" a millionaire. The John Marshall was the scene of a major communications and technological milestone in 1939 — the state's first television transmission. The broadcast included a performance by Hampton singer Dorothy Vaughan, known as "The Girl with the Cameo Voice." Sponsored by WRNL radio, the broadcast was limited to the confines of the hotel's ballroom. In the late 1930s, guests ordering dinner from the hotel menu would pay $1.75 for prime rib or $2 for a whole broiled lobster. If they chose to stay later than 10:30 p.m. for dancing, they paid a 50-cent surcharge. From Oliver Hill to Martin Luther King to Doug Wilder, how the struggles of the 20th century intersected at Richmond's Hotel John Marshall.